Richard Jones BVSc MSc MRCVS, Carli Dodd RVN, Avian Veterinary Services, 16 Dalby Court, Gadbrook Business Centre, Northwich, CW9 7TN. T: 01606 350410; F: 01606 352122. 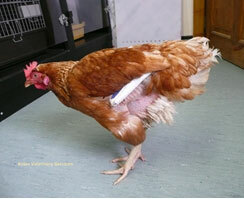 Contact details: T: 01606 350410; F: 01606 352122.info@avianveterinaryservices.co.uk and www.avianveterinaryservices.co.uk/. 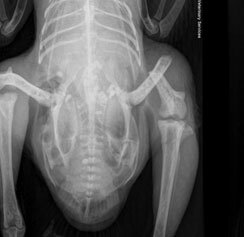 Even with the very best care, attention and nutrition accidents do happen, occasionally resulting in a fracture. Examples we have come across at our clinic range from being trodden on by a donkey to an over eager bird helping its owner with the gardening and rushing in for a worm, just as the spade was coming down….ouch!! Thankfully both birds made complete recoveries as contrary to popular opinion, birds (and from our experience chickens especially), appear to have unbelievable powers of healing and so when fractures do occur with recent advances in avian medicine and surgery they are indeed in the vast majority of cases totally repairable. When faced with a fractured limb in any bird the priority has to be the patient’s welfare and maintaining quality of life. In some cases, but certainly not all, be it due to the nature of the fracture, age of bird, concurrent disease and/or understandable economic constraints, euthanasia is indeed a humane option. As we have thankfully moved on a bit from the invention of the wheel this should not however be the ONLY option given to the owner/client. 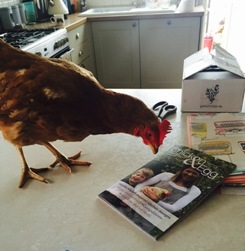 At Avian Veterinary Services we are more than happy to discuss cases and offer advice regarding various management options to local vets who in most cases will have all the equipment and medications required. The method of fracture repair depends on a number of factors; the bone involved, the nature of the fracture (is it open through a wound or closed / is it in a number of fragments / does it involve a joint?) and importantly what we regard as a satisfactory outcome. 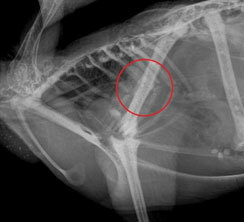 A satisfactory outcome for a wing fracture in a performance falconry bird for example is almost perfect restoration of anatomy, form and function and therefore in most cases requires surgery. A satisfactory outcome for a backyard chook is a pain free limb with function, for obvious reasons, much less of a concern (although with the recent introduction in the USA of, wait for it……….chicken agility, performance may indeed be much more of a factor in the future!). As such the vast majority of wing fractures and select leg fractures in poultry may be managed conservatively with cage rest (ex bats are particularly good at this! ), dressings/mouldable splints (see Figs. 1 and 2) and critically pain control. Birds are extremely good at masking pain which is an evolutionary adaption to deter predators (or sometimes feisty flock mates!) who can pick out and attack a weak or injured bird in the blink of an eye, but we know from clinical experience and research, they DO feel pain and respond to pain killers as we do. 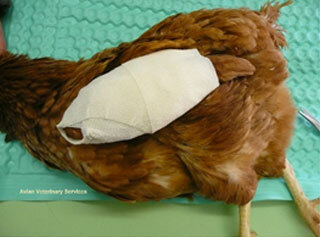 We should therefore assess avian patients based on how a particular injury might feel to us. An extreme illustration of this, which is etched in my memory from over 10 years ago, was a wild peregrine falcon presented to me by a member of the public. The bird stood proud and stared at me in defiance looking every bit a ‘normal healthy bird’ apart from the fact that both its severed wings were lying next to it in a box, having that afternoon been amputated by the propeller of a light air craft. The bird was immediately euthanized, but this has always served as an example of what birds can and do put up with and still put on a brave face. As such the vast majority of wing fractures and select leg fractures in poultry may be managed conservatively with cage rest (ex bats are particularly good at this! ), dressings/mouldable splints (see Figs. 1 and 2) and critically pain control. As already stated we do have a bit more leeway in backyard chooks with regards to what is considered a successful outcome and so surgery is always a careful consideration and in most cases short of euthanasia, considered a last resort. But if it is indeed indicated (for displaced unstable femur/thigh bone fractures for example), the professional time / skill, specialist avian anaesthesia / surgical / radiography / orthopaedic equipment required is no different from that used on a theoretically more ‘valuable’ pet parrot or falconry bird. The actual ‘purchase price’ of the bird in question is irrelevant to the cost of repair. The fact of the matter is that most avian surgical repairs from start to finish will cost in the region of £700-900 which is broken down into parts and labour like any other business. As a rough guide of what is involved, there is usually the initial x ray evaluation (Fig 3.) and approximately 2 hours anaesthesia/surgery (with professional time of both surgeon and anaesthetist) to reduce and stabilize the fracture, (Fig. 4) orthopaedic implants, medications and hospitalization. 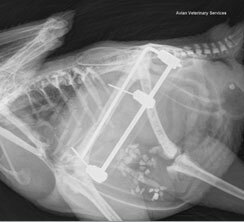 There will then usually be at least 2 further anaesthetics of about 1/2 hour each to xray and re-evaluate the fracture with gradual dismantling and complete removal of the metalwork (Fig. 5.) over a period of about 4-6 weeks. I know and fully understand for reasons discussed above, the surgical path is not for everyone. 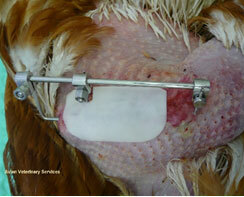 The purpose of the is article however is to simply dispel the myth that fracture repair in chickens is impossible and convey that there are in most cases many options other than euthanasia that can be rewarding, cost effective and most importantly humane, maintaining and prolonging good quality of life in these extremely entertaining characters. For more information call the BHWT Advice Line on 01884 860084. Whilst this information is based on our experience and research, we cannot accept any responsibility for the advice given. 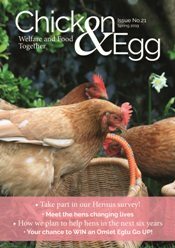 If you are in any doubt about the health of your hen(s) you should always seek veterinary advice and you can find a Hen Friendly Vet here.